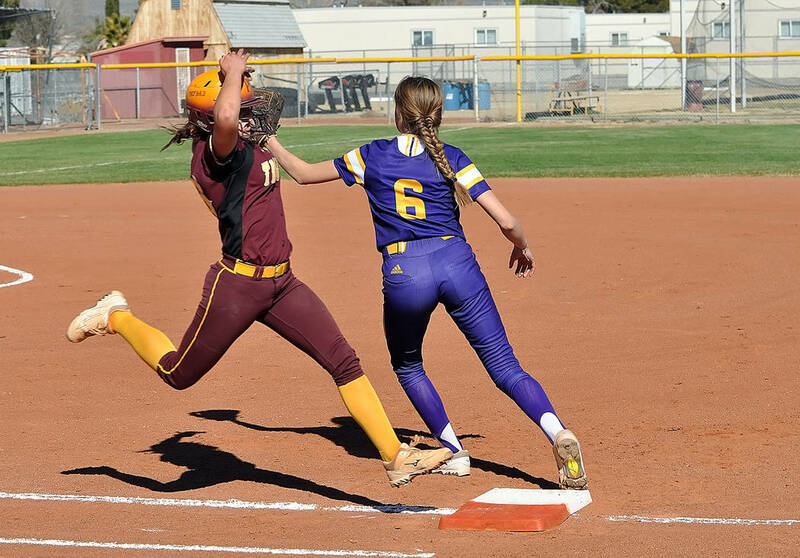 Pahrump Valley senior Amaya Mendoza showed just how good she can be in the clutch, both in the circle and at the plate. 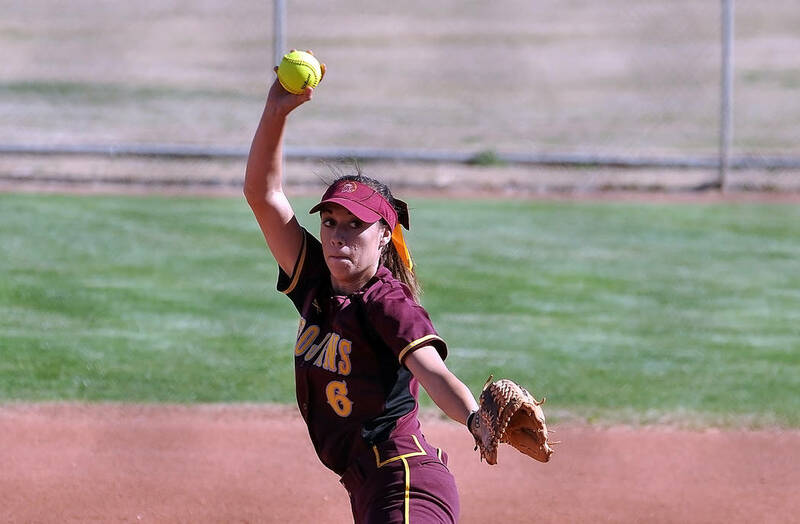 Horace Langford Jr./Pahrump Valley Times Amaya Mendoza pitched Pahrump Valley to an 11-8 softball victory over Durango on March 23 in Pahrump. Mendoza also went 2-for-4 with four RBIs, a run scored and two stolen bases. Horace Langford Jr./Pahrump Valley Times Pahrump Valley's Kathy Niles scores a run during a six-run fourth inning that helped the Trojans defeat Durango 11-8 on March 23 in Pahrump. Horace Langford Jr./Pahrump Valley Times McKayla Bartley of Pahrump Valley is safe on an infield single March 23 against Durango. Bartley went 2-for-4 and scored three runs in the Trojans' 11-8 victory. 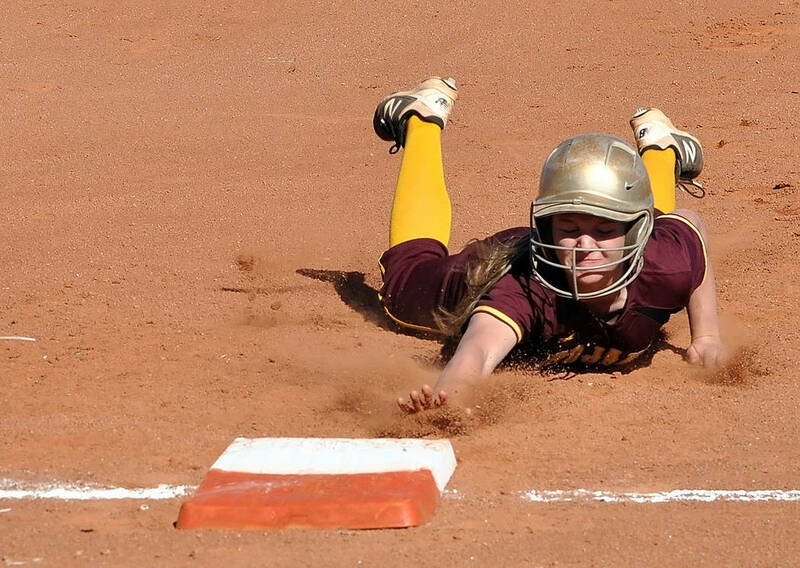 Horace Langford Jr./Pahrump Valley Times Jackie Stobbe of Pahrump Valley gets back safely to first base during the Trojans' 11-8 win over Durango on March 23 at Pahrump Valley High School. Mendoza connected for two two-out, two-run singles and came up with some huge outs to lead the Trojans to a wild 11-8 home victory on Friday over Durango in what was perhaps the most satisfying win of the young season, especially since the same team defeated the Trojans 11-3 on March 8. Usually one to throw multiple pitchers at an opponent, Armendariz decided to leave Mendoza in for the entire game. So did Armendariz. Mendoza wasn’t at her best, surrendering eight hits and five walks while hitting two batters, but each time it looked as if the Trailblazers would take a lead, there she was, getting a big out. Twice she started a batter with three balls with the tying or go-ahead run on base only to come back and record a strikeout. Twice she ended an inning by catching a Durango hitter looking at strike three. “I try to throw my changeups a lot to make them swing and miss so I get strikes on them, and then I try to throw outside or drop,” Mendoza said. But twice she also came up big at the plate. Mendoza hit a two-run single with two outs in the first and repeated that in the fourth, the latter part of a six-run inning that gave the Trojans a 9-3 lead. She also had a hand in the final run, as McKayla Bartley scored in the sixth when Mendoza hit into a double play. The big lead almost was not big enough, as the Trailblazers came back with four in the fifth. But the attempt to get even was thwarted with some spectacular defense by the Trojans. In the top of the sixth with a runner on second and nobody out, Durango pitcher Trinity Valentine launched a shot to center field that was tailing away from Pahrump Valley’s Kathy Niles. But Niles stayed with the ball and made a tremendous diving catch to electrify the Trojans bench. Mendoza did allow a run in the inning, but she also struck out two batters, fooling Destiny Cisneros badly on a changeup and catching Madison Boyce looking to end the inning. 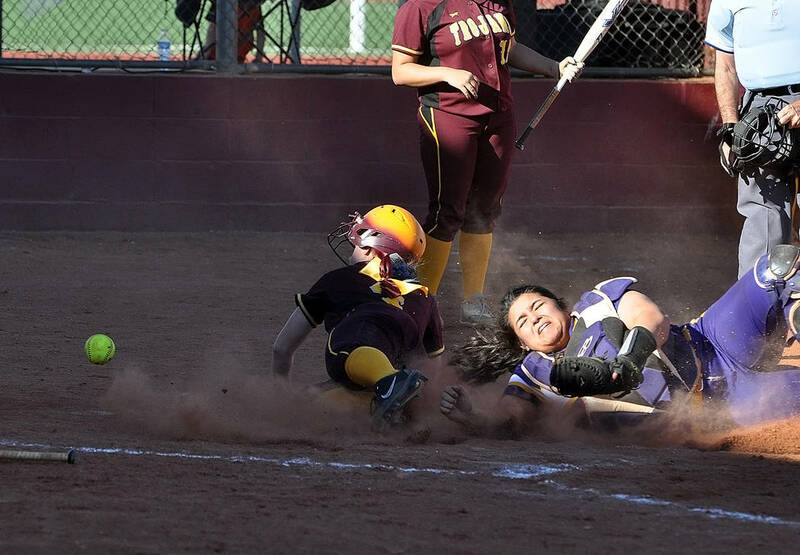 Throughout the inning, Mendoza, as well as many Pahrump Valley fans, thought she was getting squeezed by the umpire behind the plate. “I just had to keep throwing it to where they would swing because there was nothing else he would call,” she said of the apparently narrow strike zone. Any chance of a seventh-inning rally was thwarted by another sensational catch, this time by Evandy Murphy, who came in to make a diving catch on a ball hit by Durango leadoff hitter Madisyn Conriguez. The ball bounced off of and back into Murphy’s glove, leading some Trailblazer fans to claim she had dropped it, but the catch stood for the inning’s second out. “How about my outfield?” Armendariz raved after the game. “The outfield came up big today … the range from our center fielder. Those were outstanding, great efforts. “They were doing really well today, just diving all over and making great catches,” an appreciative Mendoza said. What the Trojans really did best was put the ball in play. The Trailblazers made five errors, and four of the Trojans’ hits were infield singles. Every little bit helped against Valentine, who threw with more zip on the ball than most pitchers Pahrump Valley has faced. “That’s the best pitcher we’ve seen so far this year, and we’ll see a lot more like that next weekend so I hope we’re ready for that,” Armendariz said. The coach was referring to the Centennial Spring Jamboree, an annual softball tournament at Majestic Park in Las Vegas. Friday’s win over the Class 4A Trailblazers provided a bit of confidence going into that event, which begins Wednesday.